I feel like I’ve been holding my breath for the last four years bracing myself in anticipation for the inevitable crash that was my mother’s messy destiny. I lacked motivation to move or plan of think or enjoy simple pleasures. I had a tight grip on the handrails of life. Now I feel I can breathe easily for the first time in ages. It is uncomfortable to admit there is relief but there it is. It is hard to watch a loved one suffer. So the relief is mine, as well as the guilt in feeling that. Anyway, amazingly I have begun to move – to swim, cycle, walk and practice yoga, as well as meditate, study, read and I hope to paint again too. 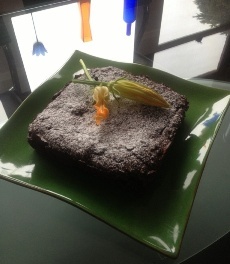 Also cook – yesterday I made this Chocolate and Zucchini cake using zucchini’s from our garden and based on the recipe from Clothilde Dusoulier the author of the book Chocolate & Zucchini, but I changed it to be gluten free. This uplifting TED Talk by Shawn Anchor was shared on Facebook by Oriah Mountain Dreamer and it made me laugh as well as remind me of the simple ways to tap into positivity. The happy secret to better work. I am currently reading The one hundred year old man who climbed out of the window and disappeared by Jonas Jonasson.